Did Ellen DeGeneres Just Confirm That Kylie Jenner Is Pregnant? If there's one person who always seems to know all the celebrity gossip before the rest of us, it's friend-to-the-stars, Ellen DeGeneres. So you can imagine our excitement when she posted an Instagram which seemed to confirm one of the biggest ongoing showbiz rumors. While promoting the fact that Khloe Kardashian—who is six months pregnant—would be joining her on her chat show, she also seemed to confirm that Khloe's sister Kylie Jenner is in fact also pregnant. Alongside a video of Khloe being introduced on her show, Ellen wrote: "@KhloeKardashian and her baby bump are here tomorrow. @KylieJenner and her baby bump are watching from home." So does she know something we don't know? Does she know for sure that Kylie is pregnant with her and Travis Scott's first baby? We wouldn't be surprised seeing as Ellen is a close family friend of all the Kardashians and Jenners. Jeez, she'll probably even end up being Kylie's baby's godmother. 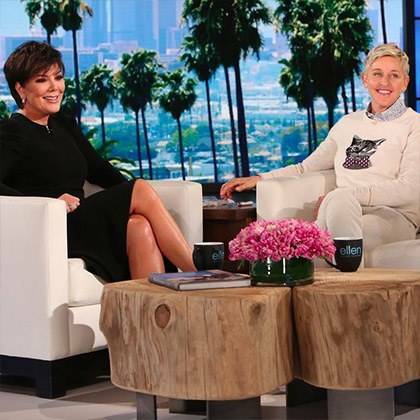 Ellen has always been at the forefront of trying to get Kardashian/Jenner pregnancy confirmation on her show—she desperately tried to get Kris Jenner to confirm Khloe's baby news in November when she appeared on her show. Discussing a previous sketch in which Ellen dressed as the "other Kardashian sister" Karla and tried to get Kendall Jenner and Kourtney Kardashian to admit that they're expecting, Kris said: "You do make up a lot of stories, though. You know, the little fibs." Ellen replied: "OK, they're [Kendall and Kourtney] not, but you have lots of pregnant children right now. A whole bunch of them." Kris said to the audience: "Oh, I can feel where this is going. She's trying to trick me into confirming pregnancies." Yes, she is. Smart woman, that Ellen.